Some fish fared better than others amid the extreme temperatures of the 2016 heatwave. The 2016 marine heatwave that killed vast amounts of coral on the Great Barrier Reef also caused significant changes to fishes and other animals that live on these reefs. Coral habitats in the Great Barrier Reef (GBR) and in the Coral Sea support more than 1,000 fish species and a multitude of other animals. Our research, published in Nature today, documents the broader impact across the ecosystem of the widespread coral losses during the 2016 mass coral bleaching event. While a number of fish species were clearly impacted by the loss of corals, we also found that many fish species responded to the increased temperatures, even on reefs where coral cover remained intact. The fish communities in the GBR’s southern regions became more like those in warmer waters to the north, while some species, including parrotfishes, were negatively affected by the extreme sea temperatures at the northern reefs. The loss of coral robs many fish species of their preferred food and shelter. But the warming that kills coral can also independently cause fish to move elsewhere, so as to stay within their preferred temperature range. Rising temperatures can also have different effects on the success, and therefore abundance, of different fish populations. One way to tease apart these various effects is to look at changes in neighbouring reefs, and across entire regions that have been affected by bleaching, including reefs that have largely escaped coral loss. We were able to do just this, with the help of highly trained volunteer divers participating in the Reef Life Survey citizen science program. We systematically surveyed 186 reefs across the entire GBR and western Coral Sea, both before and after the 2016 bleaching event. We counted numbers of corals, fishes, and mobile invertebrates such as sea urchins, lobsters and giant clams. Sea temperatures and coral losses varied greatly between sites, which allowed us to separate the effects of warming from coral loss. In general, coral losses were much more substantial in areas that were most affected by the prolonged warmer waters in the 2016 heatwave. But these effects were highly patchy, with the amount of live hard coral lost differing significantly from reef to reef. For instance, occasional large losses occurred in the southern GBR, where the marine heatwave was less extreme than at northern reefs. Similarly, some reefs in the north apparently escaped unscathed, despite the fact that many reefs in this region lost most of their live corals. Our survey results show that coral loss is just one way in which ocean warming can affect fishes and other animals that depend on coral reefs. Within the first year after the bleaching, the coral loss mostly affected fish species that feed directly on corals, such as the butterflyfishes. But we also documented many other changes that we could not clearly link to local coral loss. Much more widespread than the impacts of the loss of hard corals was a generalised response by the fish to warm sea temperatures. The 2016 heatwave caused a mass reshuffling of fish communities across the GBR and Coral Sea, in ways that reflect the preferences of different species for particular temperatures. In particular, most reef-dwelling animals on southern (cooler) reefs responded positively to the heatwave. The number of individuals and species on transect counts generally increased across this region. By contrast, some reefs in the north exceeded 32℃ during the 2016 heatwave – the typical sea temperature on the Equator, the hottest region inhabited by any of the GBR or Coral Sea species. Some species responded negatively to these excessive temperatures, and the number of observations across surveys in their northernmost populations declined as a consequence. Parrotfishes were more affected than other groups on northern reefs, regardless of whether their local reefs suffered significant coral loss. This was presumably because the heatwave pushed sea temperatures beyond the level at which their populations perform best. Nothing to smile about: some parrotfishes don’t do well in extreme heat. Local populations of parrotfishes will probably bounce back after the return of cooler temperatures. But if similar heatwaves become more frequent in the future, they could cause substantial and lasting declines among members of this ecologically important group in the warmest seas. Parrotfishes are particularly important to the health of coral reef ecosystems, because their grazing helps to control algae that compete with corals for habitat space. A key message from our study is not to overlook the overarching influence of temperature on coral reef ecosystems – and not to focus solely on the corals themselves. Even if we can save some corals from climate change, such as with more stress-tolerant breeds of coral, we may not be able to stop the impacts of warming seas on fish. Future ecological outcomes will depend on a complex mix of factors, including fish species’ temperature preferences, their changing habitats, and their predators and competitors. These impacts will not always necessarily be negative for particular species and locations. One reason for hope is that positive responses of many fish species in cooler tropical regions may continue to support healthy coral reef ecosystems, albeit in a different form to those we know today. It is no longer news that the Great Barrier Reef has suffered extreme bleaching. In early 2016, we heard that the reef had suffered the worst bleaching ever recorded. Surveys published in June that year estimated that 93% of coral on the vast northern section of the reef was bleached, and 22% had already been killed. Further reports from this year show that bleaching again occurred. The back-to-back bleaching hit more than two-thirds of the Great Barrier Reef and may threaten its UNESCO World Heritage listing. After recent years of damage, what does the future hold for our priceless reef? Our new research, published in the Bulletin of the American Meteorological Society’s special report on climate extremes, shows the news isn’t good for the Great Barrier Reef’s future. Coral reefs are complex ecosystems that are affected by many factors. Changes in sea surface temperatures, rainfall, cloudiness, agricultural runoff, or water quality can affect a reef’s health and resilience to stress. Early analysis of the 2016 bleaching suggested that the Great Barrier Reef was suffering from thermal stress brought on by human-caused climate change. Our study took a new and comprehensive approach to examine these multiple climatic and environmental influences. We set out to answer the crucial question: could anything else have bleached the Great Barrier Reef, besides human-induced climate change? The results were clear. Using a suite of climate models, we found that the significant warming of the Coral Sea region was likely caused by greenhouse gases from human activities. This warming was the primary cause of the extreme 2016 bleaching episode. But what about those other complex factors? The 2016 event coincided with an El Niño episode that was among the most severe ever observed. The El Niño-Southern Oscillation system, with its positive El Niño and negative La Niña phases, has been linked to bleaching of various coral reefs in the past. Our study showed that although the 2016 El Niño probably also contributed to the bleaching, this was a secondary contributor to the corals’ thermal stress. The major factor was the increase in temperatures because of climate change. We next analysed other environmental data. Previous research has found that corals at sites with better water quality (that is, lower concentrations of pollution particles) are more resilient and less prone to bleaching. Pollution data used in our study show that water quality in 2016 may have been better than in previous bleaching years. This means that the Great Barrier Reef should have been at lower risk of bleaching compared to long-term average conditions, all else being equal. Instead, record bleaching hit the reef as a result of the warming temperature trend. The final part of our investigation involved comparing the conditions behind the record 2016 bleaching with those seen in previous mass bleaching episodes on the Great Barrier Reef, in 1997-98 and 2010-11. When we analysed these previous events on the Reef, we found very different factors at play. In 1997-98 the bleaching coincided with a very strong El Niño event. Although an El Niño event also occurred in 2016, the two were very different in terms of the distribution of unusually warm waters, particularly in the eastern equatorial Pacific. In 1997-98, the primary cause of the bleaching – which was less severe than in 2016 – was El Niño. In 2010-11, the health of the Great Barrier Reef was impaired by runoff. That summer brought record high rainfall to eastern Australia, causing widespread flooding across Queensland. As a result of the discharge of freshwater onto the reef reducing the salinity, bleaching occurred. There have been many reports in recent years warning of trouble for the Great Barrier Reef. Sadly, our study is yet another warning about the reef’s future – perhaps the most comprehensive warning yet. It tells us that the 2016 bleaching differed from previous mass bleaching events because it was driven primarily by human-induced climate warming. This puts the Great Barrier Reef in grave danger of future bleaching from further greenhouse warming. The local environmental factors that have previously helped to protect our reefs, such as good water quality, will become less and less able to safeguard corals as the oceans warm. Now we need to take immediate action to reduce greenhouse gas emissions and limit further warming. Without these steps, there is simply no future for our Great Barrier Reef. Human activity, along with a strong El Nino, drove 2016 greenhouse gas levels to new heights. Global average carbon dioxide concentrations rose by 0.8% during 2016, the largest annual increase ever observed. According to figures released overnight by the World Meteorological Organisation, atmospheric CO₂ concentrations reached 403.3 parts per million. This is the highest level for at least 3 million years, having climbed by 3.3 ppm relative to the 2015 average. The unprecedented rise is due to carbon dioxide emissions from fossil fuels (coal, oil and gas) and the strong 2015-16 El Niño event, which reduced the capacity of forests, grasslands and oceans to absorb carbon dioxide from the atmosphere. Greenhouse gas levels are unprecedented in modern times. The figures appear in the WMO’s annual Greenhouse Gas Bulletin. This is the authoritative source for tracking trends in greenhouse gases that, together with temperature-induced increases in atmospheric water vapour, are the major drivers of current climate change. Laboratories around the world, including at CSIRO and the Bureau of Meteorology in Australia, measure atmospheric greenhouse gas concentrations at more than 120 locations. The gases include carbon dioxide, methane and nitrous oxide, as well as synthetic gases such as chlorofluorocarbons (CFCs). At Cape Grim in Tasmania, we observed a corresponding increase during 2016 of 3.2 ppm, also the highest ever observed. For 2017 so far, Cape Grim has recorded a smaller increase of 1.9 ppm. This possibly reflects a reduced impact of El Niño on atmospheric carbon dioxide growth rates this year. Long-term record of background carbon dioxide from Cape Grim, located at the northwest tip of Tasmania. For roughly 800,000 years before industrialisation began (in around the year 1750), carbon dioxide levels remained below 280 parts per million, as measured by air trapped in Antarctic ice. Geological records suggest that the last time atmospheric levels of carbon dioxide were similar to current levels was 3-5 million years ago. At that time, the climate was 2-3℃ warmer than today’s average, and sea levels were 10 to 20 metres higher than current levels. The extraordinarily rapid accumulation of CO₂ in the atmosphere over the past 150 years is overwhelmingly and unequivocally due to human activity. Methane is the second-most-important long-lived greenhouse gas in the atmosphere, with 40% coming from natural sources such as wetlands and termites and the remaining 60% from human activities including agriculture, fossil fuel use, landfills and biomass burning. In 2016, global atmospheric methane also hit record levels, reaching 1,853 parts per billion, an increase of 9 ppb or 0.5% above 2015 levels. At Cape Grim, methane levels climbed by 6 ppb in 2016, or 0.3% above 2015 levels. Nitrous oxide is the third-most-important greenhouse gas, of which [around 60% comes from natural sources such as oceans and soils], and 40% from fertilisers, industrial processes and biomass burning. In 2016, global atmospheric nitrous oxide hit a record 328.9 ppb, having climbed by 0.8 ppb (0.2%) above 2015 levels. At Cape Grim, we observed the same annual increase of 0.8 ppb. If we represent the climate change impact of all greenhouse gases in terms of the equivalent amount of CO₂, then this “CO₂-e” concentration in the atmosphere in 2016 would be 489 ppm. This is fast approaching the symbolic milestone of 500 ppm. These record greenhouse gas levels are consistent with the observed rise in global average temperatures, which also hit record levels in 2016. The only way to reduce the impact is to significantly reduce our greenhouse gas emissions. The Kyoto Protocol and the subsequent Paris Agreement are important first steps in a long and challenging process to reduce such emissions. Their immediate success and ultimate strengthening will be crucial in keeping our future climate in check. The authors thank Dr David Etheridge for his advice on the use of proxy measurements to infer carbon dioxide levels in past atmospheres. 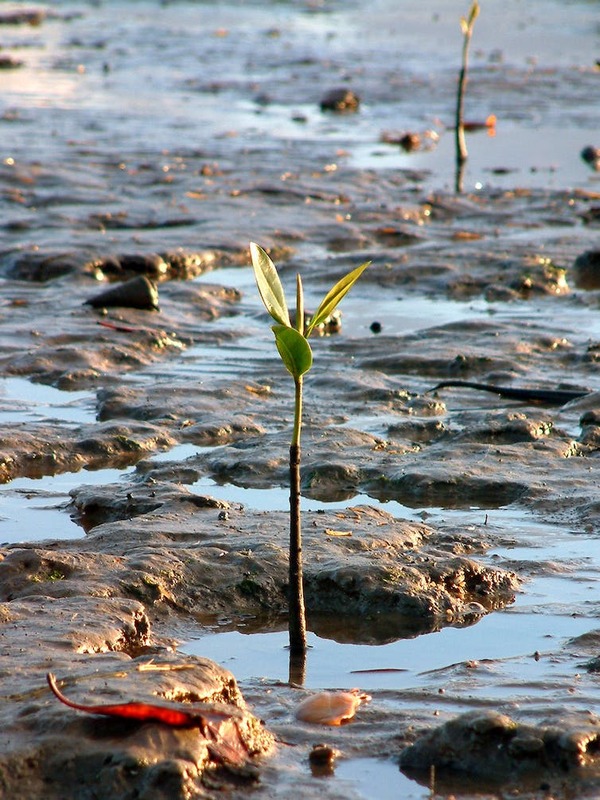 Green shoots: a mangrove in Cairns enjoys the wet. Not all of Australia was so lucky. After several dry years, vegetation across much of Australia received much-needed rains in 2016. But this broad pattern of improvement belies some major environmental damage in parts of the country – particularly in Tasmania, which was scorched by bushfire, the Gulf Coast and Cape York, which missed out on the rains’ return, and on the Great Barrier Reef, which suffered massive coral bleaching. That is the conclusion of our report on Australia’s Environment in 2016, released today. It’s a summary of the state of the nation’s environmental indicators, which we compiled by analysing huge amounts of satellite imagery, ground data, and water and landscape modelling. The report and the accompanying Australia’s Environment Explorer website summarise those data into graphs and plots for 13 environmental indicators. With most data extending back to at least the year 2000, this makes it possible to see how the environment is changing. The overall story is one of rainfall boom after four years of bust. The national average rainfall in 2016 was again well above average, albeit not quite as much as in the bumper years 2010-11. Our report last year showed soil moisture conditions had reached a six-year low in 2015, as Australia was dragged back towards the conditions experienced during the Millennium Drought. The rains of 2016 seem to have put at least a temporary end to this. Over the past year the soil moisture in Australia’s landscapes has bounced back to levels not seen since 2012. Vegetation growth, leaf matter and soil protection all followed the same pattern. Despite major bushfires in Tasmania in January, there were fewer fires overall than in previous years. As a result, carbon emissions from bushfires were the lowest since 2010, meaning that 2016 was overall a good year for land-based carbon emissions. We combined the data to produce an overall “environmental scorecard” for each state and territory, as well as for the nation as a whole. Inevitably, this introduces subjective judgements, but because so much of the environment’s health is linked to water availability, the overall pattern would remain similar even if we were to calculate the index differently. The national environmental score increased to above average (6.7), but the improvements were uneven. 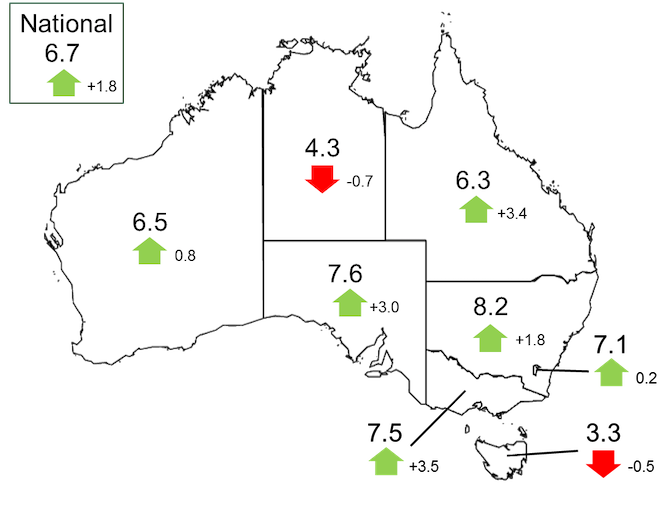 Scores fell in Tasmania and the Northern Territory, in the aftermath of dry conditions that had already started in 2015 or before, whereas other states improved by varying amounts. Large parts of Queensland had been suffering through several years of drought but bounced back with good rains and growth conditions. Despite this, much of the state remains officially drought-declared – although not, ironically, Cape York. Such contrasts are not unusual; it often takes more than a year of good rain for drought declarations to be lifted. Meanwhile, the Channel Country and many of the Murray-Darling Basin rivers received their best flows since the Big Wet of 2010–12, replenishing floodplains and wetlands along the way. Continued dry conditions in northwestern Tasmania created the conditions for massive bushfires in the first two months of 2016. The fires affected an estimated 95,000ha across the state, including 18,000ha of vulnerable alpine ecosystems in the Tasmanian Wilderness World Heritage Area. Although that is less than 1% of the total World Heritage Area, the ancient vegetation may have changed permanently. Characteristically for Australia, the fires were followed by a deluge, restoring soil moisture levels from May onwards but also causing major flood damage. In the Top End, areas around the Gulf of Carpentaria missed out on the rains and continued a dry run that has lasted for four years in some places. Cape York was left high and dry, with historically low rainfall records at some locations. Mangrove trees died in large numbers along 700km of coast on the Gulf of Carpentaria. The record temperatures and ongoing dry conditions were a likely factor. Mangroves provide breeding grounds for many sea organisms and protect the coast from erosion, and their demise may cause knock-on effects into the future. Evidence of mangrove dieback along a short stretch of Gulf Coast, NT. To Australia’s east, high sea temperatures played an important role in large-scale bleaching on the Great Barrier Reef. Reefs and mangroves have been wiped out and recovered before, such as after cyclones. But the sheer scale of last year’s damage was unusual and set against an unmistakable climate warming trend. The big question is whether these ecosystems will be able to recover before suffering the next setback. So, while all of our national headline environmental indicators suggest signs of general recovery, not everything is easily summarised or understood. The full consequences of the damage done to the Great Barrier Reef, tropical mangrove forests and Tasmania’s wilderness may take several years to become clear. Worryingly, the factors that drove them into decline are likely to become stronger in future. Add to that the record heatwaves this year, and it becomes clear that climate change will not just quietly disappear.